James Ley, a master of many moods in the voice. 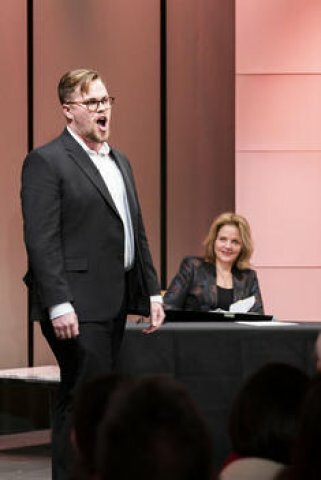 SongStudio with Renee Fleming took place in the Resnick Education Wing of Carnegie Hall. For many years, Marilyn Horne produced The Song Continues at Carnegie Hall. Singers from the world over came for coaching and master classes and also performances. Horne was an ambassador for song, and no one fit this role better. Horne had a storied career as a mezzo opera diva. Yet she was committed in the quotidian, putting together the pieces which keep song alive. Carnegie was her partner. Horne became familiar in the highways and byways of performance space. Appearing at a church, where a Carnegie artist was concertizing, or in New York's outer boroughs, she wove her magic, inducing new audiences to come and listen. Her family lived in California and she decided to spend full time there. 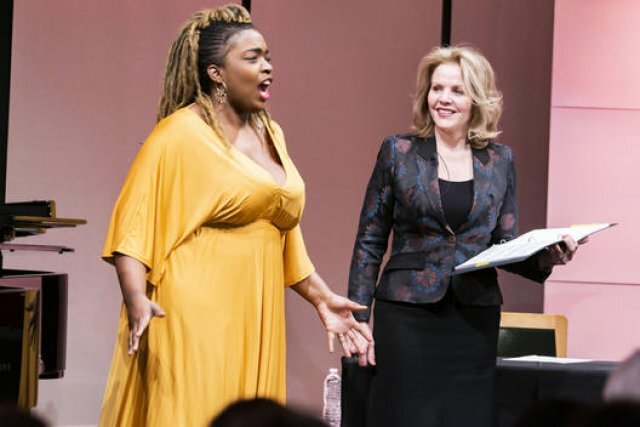 In a tribute to Horne, whose multi-faceted mantle needed filling in the east, Renee Fleming joined Carnegie to start a new training ground for young artists. The new name is SongStudio. Its approach is very much the same as Horne’s. 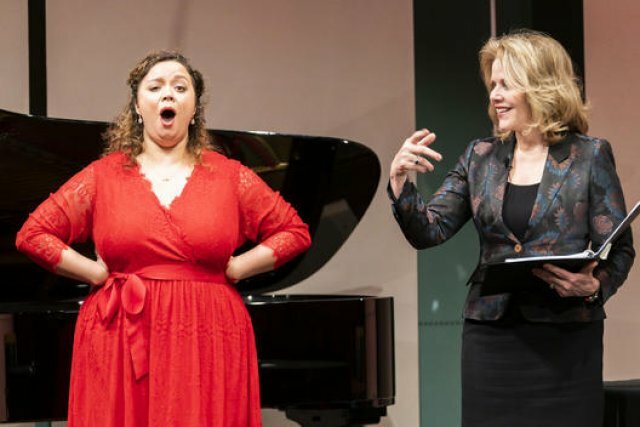 Fleming’s passionate commitment to the form shines through each evening, as singers gather in master classes with Fleming herself, the composer Nico Muhly and Piotr Beczala, the great tenor. Communication is the theme this year. Fleming has gone for the jugular in addressing the problem of song’s survival. How do singers communicate with an audience so people want to come and hear them? Singing talent is abundant in this country. The worldwide reach of SongStudio may matter less in Germany and China, for instance, where audiences are built by an educated public who pass down the pleasure of concert going generation to generation. This is not true in the United States. Various institutions bus students in for dress rehearsals and performances. Deep student discounts are offered. Yet one senses, looking out across a classical audience in traditional venues, that funerals are not going to help the situation. This issue is dealt with at SongStudio by exporting the talent to various corners of the city. Proximity may fan new listeners fire for the song form. Fleming is a generous teacher and a charming ambassador for classical music, even as she spreads her wings on Broadway and the West End, to say nothing of the Super Bowl. She speaks to singers about communicating with the audience where the magic of song begins. An introductory panel asked what composers wanted from singers. Fleming and Dawn Upshaw, the superb soprano who is known for commissioning and performing new works, bracketed three composers. John Musto's songs were sung by the up and coming tenor James Ley. Ley made a wordy song of Musto's sound easy. his perfect diction and adventuresome but unified delivery was stunning. Paola Prestini, one of the founders of National Sawdust, brought guest artists bass Zachary James and cellist Jeffrey Zeigler to perform parts of her composition inspired by Ernest Hemingway’s “Old Man and the Sea." The audience was carried to the boat rocking on the waters and could imagine characters James sang evocatively. Chris Thile, who will take the full stage at Carnegie on March 9, sang us a delightfully small song accompanying himself on mandolin. The lessons of the week also ended surprisingly in the beauty of quiet sound. The following evening, Fleming herself taught four delightful singers. She focuses on the details which mold into a phrase to make a song performance captivating. Enrico Lagasca, bass baritone who appears on the Metropolitan Opera stage as well the New York Philharmonic, has a dark, rich sound which he uses effectively to color emotional context. He is an example of the difference a comment from Fleming can make, as he takes up a phrase once again to enhance it. Fleming’s generosity not only extends to the young singers she has gathered for the Studio, but to the audience attending her sessions. Fleming brings a collaboration with Pulitzer-prize winning composer Kevin Puts to Tanglewood on July 20 at 8pm.